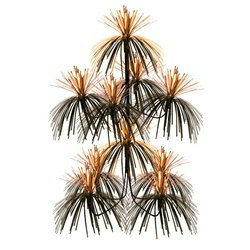 This Orange and Black Firework Chandelier is a great decorating value because it can be hung over your table as a chandelier or you can use it as a chandelier centerpiece. This item consists of bendable wire that will stand on its own four legs or hang it up. At two feet tall it makes for a large sized foil decoration. The shiny metallic orange and black firework bursts are perfect for Halloween decorating. Check out all of the different color chandelier centerpieces available for different party and holiday themes.